Have a solid academic record, which must include submission on an official transcript showing a student’s grade point average through the second-quarter marking period of his or her senior year. Must be involved in community affairs, extracurricular activities and/or have work experience. A record of volunteer service not required for school credit or graduation will be given extra consideration. Must write an essay explaining the scholarship award’s importance to her or him and how the money will be used. Candidates also are asked to provide information on colleges to which they have applied or been accepted, their planned college major and career goals. Rosemarie Papa, the club’s education committee chairperson, will lead the review of all applications, utilizing a “blind selection” process, where the identities of applicants will remain unknown to the seven-member committee. Scholarship winners will be notified in May and presentations will be made on Friday, June 7 at the club’s monthly meeting. For some 30 years, the Belmar Woman’s Club has offered these scholarships, which are supported by its fundraising activities. The number of awards is based each year on the success of those efforts. 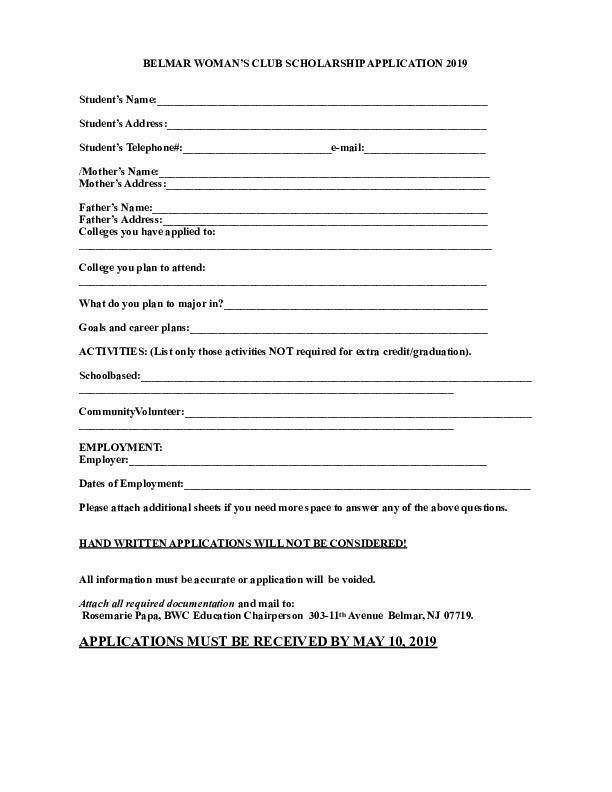 Scholarship applications are available at high school Guidance Departments. An application can also be found here .